In the late 1980s, after touring extensively around the world, Rauschenberg returned to his studio on Captiva Island in Florida where he began making his ‘glut’ series. The inspiration for this series was the recession that hit Texas in the 1980s due to an oil glut on the global financial market. 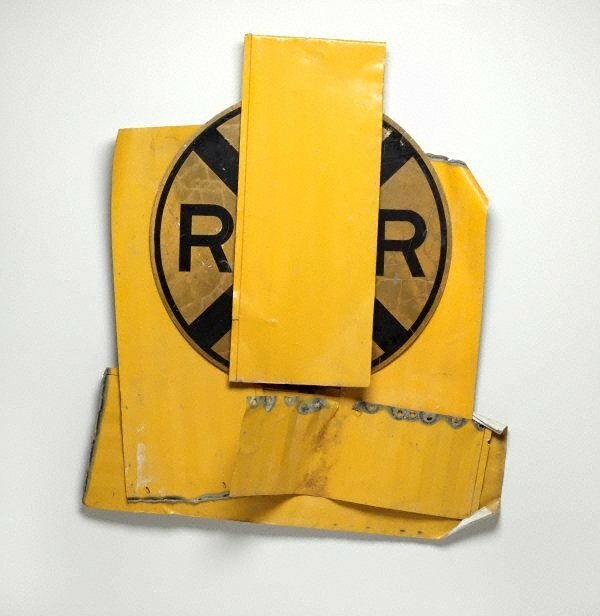 In 1985 Rauschenberg held a major exhibition at the Contemporary Arts Museum, Houston and while driving to the museum noticed all the scrap metal and car wrecks littering the Texan roadsides. The works in the ‘glut’ series are made out of car parts, containers and road signs that are assembled or twisted into poetic and elegant shapes. Gift of the John Kaldor Family Collection 2010. Donated through the Australian Government's Cultural Gifts Program.